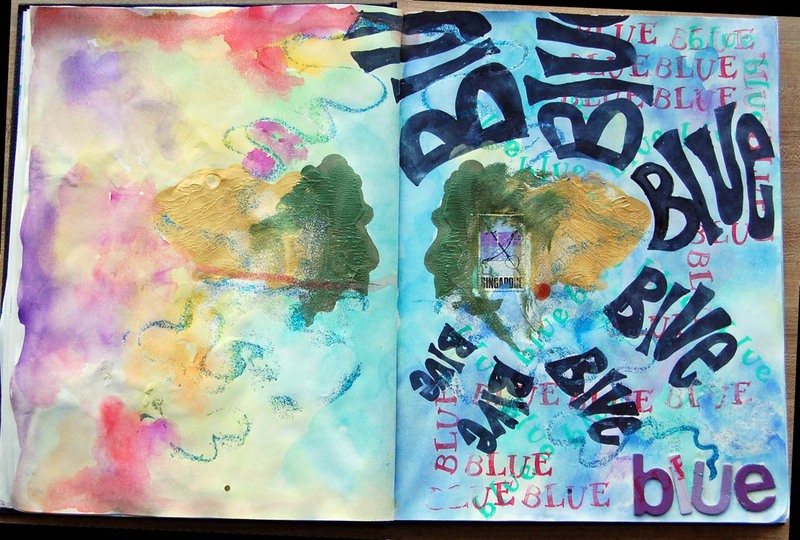 BalzerDesigns: 1 min Art Journaling Idea:: Choose a word and write it in messy script across your page at least twelve times. Use all different angles! i didn’t follow the directions exactly, but here is how my page turned out. i am feeling a little under the weather today, and a little…you guessed it, blue. so i am not feeling my usual verbose self. see you all tomorrow! This entry was posted in art journal and tagged art journal, art journal every day, artjournaleveryday, balzer designs, postaday2011. Bookmark the permalink. Hope you’re feeling better tomorrow x I’m totally besotted by the idea of art journalling but can’t seem to get started :o/ Very impressed that you can do it every day! Oh my gosh! Love, love, love! Wow, look this idea. I am enjoying your ideas. It must be this winter weather ? ! ! that I can be an artist, in my home, but none the less an artist. Feels good! thanks! glad you feel inspired! Nice! I had a hard time doing this one in a messy manner and had to force myself to let go. I did an OK job at it and want to try it again. would you please provide the link for the art journalling ideas? i’ve checked balzer designs, but i just can’t see it – there is so much stuff on there, i am visually confused. i’m constantly on the lookout for ideas for the expressive arts group. with 28 sessions per year, and this year will be the 3rd year, i’m starting to run out of ideas.